Cardinals President Michael Bidwill went to prep school with Judge Brett Kavanaugh and was among the classmates who sent a letter to ranking U.S. senators to vouch for his character, the Arizona Republic reports. 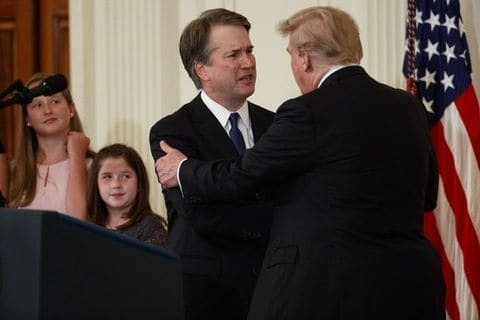 President Donald Trump announced his intent to nominate Kavanaugh to the high court during a primetime ceremony at the White House. The tweet drew a backlash from fans who said it was inappropriate for the team to weigh in on a divisive, political issue. The article was written by a writer for the team’s website, Azcardinals.com. The story recounted Bidwill’s decades-long friendship with Kavanaugh, and quoted from a letter he and other Georgetown Prep alumni emailed to Senate leaders to vouch for Kavanaugh’s professional talent and personal character. Bidwill and three other classmates led the effort to reconnect with classmates and send the letter, the Azcardinals.com story said. Bidwill, a political power player who frequently takes active roles alongside Republicans like Gov. Doug Ducey — and not so long ago, U.S. Sen. John McCain — waded into a divisive nomination Monday evening. The tweet from the Cardinals account drew swift condemnation by dozens of followers, who said the team should keep politics out of football. It was “liked” more than 200 times as of 7:30 p.m. Monday.